Oh, so delicate, christmassy candle mats! 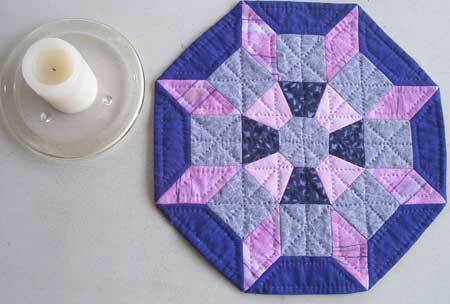 2008 certainly turned out to be a year of English Paper Piecing addiction for me! 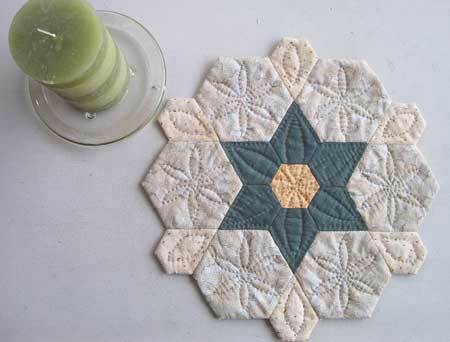 Several hexagon table runners, placemats and tons of coasters have been part of the projects accomplished (and actually finished!) this year. I have so much enjoyed this technique a couple of weeks ago I started drawing more and more projects for this technique. Some of them are large and complicated… I think I’ll wait until January to start on one of those. 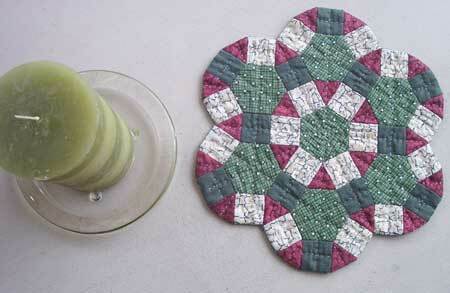 In the meantime, I not only drew, but actually sewed a few candle mats, just in time for Christmas! Subscribed members can download the project files for these candle mats by following the links for the Christmas Wheels, Six-Point Star, and Starcrossed candle mats.